A meal. A friend. A community. This is the promise Meals on Wheels San Diego County makes to more than 3,200 people each year, including 1,400 veterans. We at A-1 Self Storage are proud to support an amazing organization that has served the elderly and disabled with care and compassion for more than 58 years. Advances in modern medicine and increased access to healthcare are contributing to Americans living longer than ever. The majority of babies born in 1900 did not live to the age of 50, and in 2012 average life expectancy at birth passed 78.8 years in the U.S. While this is a great achievement, the cost of living has also increased substantially compared to even 50 years ago, and many Americans have found themselves experiencing financial difficulty in their twilight years. 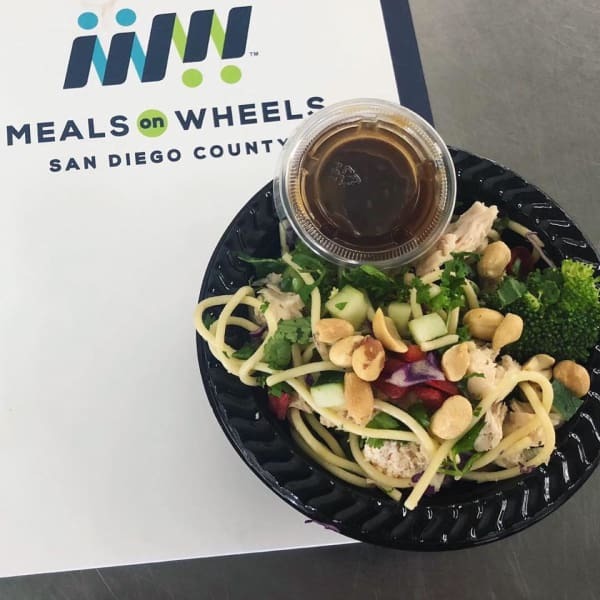 Barbara Fiorina, Director of Development for Meals on Wheels San Diego County, says the organization prides itself on providing high-quality food at a low cost. Meals average $3.50 each, and recipients pay on a sliding scale based on need. Fresh lunch is served 6 days a week, and the charity even sources a portion of the produce it serves from its own garden and orchard, including oranges, limes, grapefruit, kale, tomatoes, mint, and rosemary. By providing more than a 1,000 meals a day, almost 450,000 meals a year, this organization serves some of San Diego County’s neediest residents. According to Barbara, more than 85% of seniors who receive assistance are considered low or very-low income by the U.S. Department of Housing and Urban Development. This is why the work that Meals on Wheels San Diego County does is so important. The vast majority of people who receive assistance want to stay in their homes rather than move into an assisted living facility. According to Barbara, many recipients could not afford the cost of assisted living, and there are likely not enough facilities to accommodate those served by the charity. The volunteers and staff at Meals on Wheels San Diego County make sure these seniors can safely maintain their independence. Meals on Wheels San Diego County provides much-needed support and not just in the form of food. The people who visit Meals on Wheels’ clients are volunteers. It’s their job to deliver meals, perform wellness checks, and assist anyone who may be experiencing hardship. For family members living far away from their elderly relatives, the regular social contact that comes with a Meals on Wheels San Diego County visit is very important – sometimes life-saving. Meals on Wheels San Diego County provides assistance to any county resident over the age of 60. Eligible individuals who wish to receive assistance just have to call 619-260-6110 to begin meal delivery. 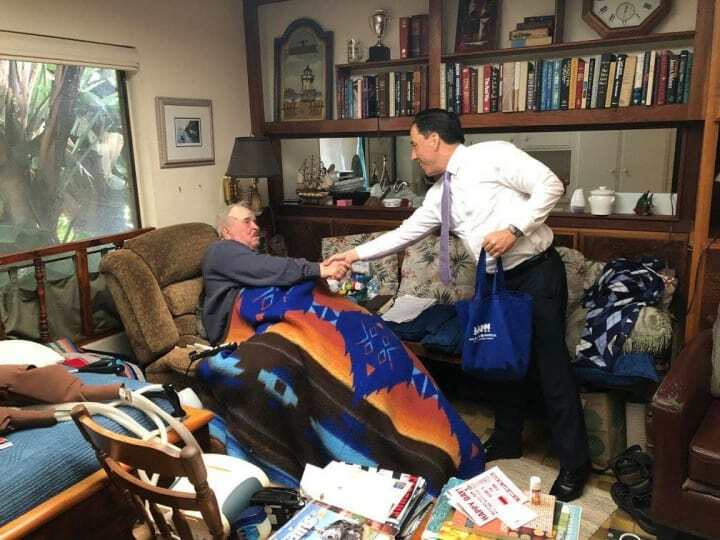 Those who are not quite 60 yet, but are experiencing disability or illness, especially veterans, are encouraged to reach out as well because Meals on Wheels San Diego County makes exceptions for these situations. Meals on Wheels San Diego County even has a program to provide food for the pets of eligible residents called Animeals. Last year, more than 160 dogs and 120 cats were fed through the program. This was a great success. During the next 18 months, Barbara is rolling out a pilot program using a cell phone app called Mobile Meals. Volunteers will use this app to more efficiently deliver meals, and record data on interactions with clients, that can be used to provide better care in the future. This data is currently being collected manually using a pen, paper, and many three-ring binders. A-1 Self Storage is honored to support Meals on Wheels San Diego County. Thank you to the many volunteers and staff who are committed to caring for San Diego’s elderly and disabled. We are thankful for the opportunity to donate to such an important and effective organization. 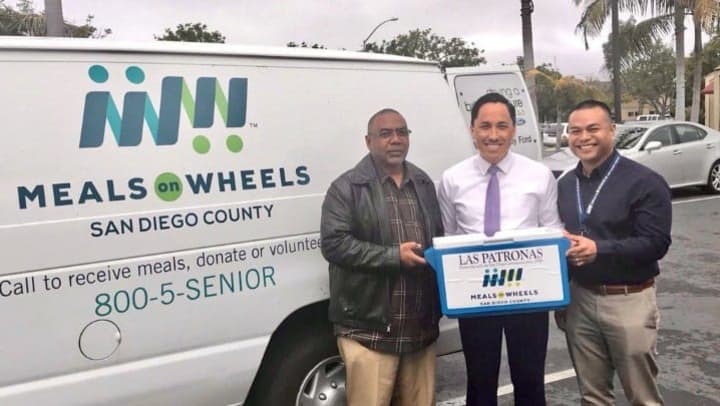 If you would like to learn more about the Meals on Wheels San Diego County program, or to make a donation, visit their website at https://www.meals-on-wheels.org/.